"Aesthetic Automation: The Hand Behind the Machine" is an exhibition of six sculptures and drawings by Baltimore-based artist Chris Bathgate. Bathgate is a self-trained machinist. He has spent more than 15 years adapting metalworking machinery from salvaged and repurposed equipment. 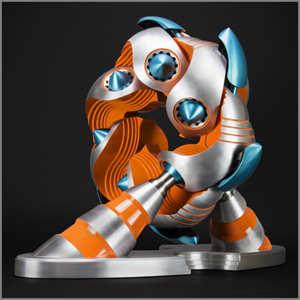 His intricately machined sculptures combine his unique metalworking style with a practical approach to engineering complex metal objects. His approach to art-making suggests that creativity alone does not drive human imagination, but that it is also inspired by the need to solve problems. For Bathgate, the restraints inherent in his process are a catalyst for his ideas. Bathgate’s sculptures are at once familiar and alien. They suggest utility, but are ambiguous, full of implied yet undefined purpose. Bathgate has been featured in American Craft Magazine, Make Magazine, the Russian edition of Popular Mechanics, Sculptures Pacific, and Best of American Sculpture Volume II. He was awarded grants in 2007 and 2011 from the Pollock-Krasner Foundation. He has also earned recognition in his own hometown, having received the Mary Sawyers Baker Prize in 2014, a Baltimore “B” grant in 2011, and a Creative Baltimore grant in 2008. Bathgate’s works have been exhibited in a variety of museums and galleries, including the Museum of Arts and Design in New York, the Baltimore Museum of Art, the American Craftsmanship Museum, Carlsbad, California, and the Dennis and Phillip Ratner Museum, Bethesda.